In celebration of Oregon's sesquicentennial anniversary, Poetry Northwest and the Oregon State Library have named 150 outstanding Oregon poetry books — one for each year of statehood. The hefty list was created with input from poetry readers across the state. Featuring a mix of established and emerging writers, the list is an impressive show of poetic range. Poetry, it seems, is family-friendly, with blood and love lines threading the directory: father and son William and Kim Stafford; brothers Matthew and Michael Dickman; and husband and wife Ralph Salisbury and Ingrid Wendt. 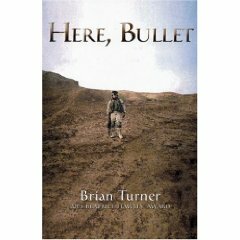 It's a powerful endeavor, both creating the roster and reading the books, and I'm happy to recognize some of my favorites (Toluca Street by Maxine Scates; Here, Bullet by Brian Turner), and to add the others to my growing list of must-reads. How about you? Have you read all 150? What are your favorites? Are there missing teeth in this ambitious compilation? I'm eager to know what you think. Go here for the Oregon 150 Poetry Book List.